Sarasota’s unique entertainment experience for kids and grown-ups alike. Livingston’s is your one-stop shop for hours of fun, food, & entertainment. Featuring Billiards, Go Kart Racing, Phazer Zone, Rock Climbing, Arcade & Prize Center, Food & Bar, and Events & Parties. If you’re looking for a fun full night for the whole family or just for the kids… This is the place for you. 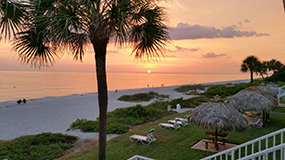 The SFMV is a non-profit organization committed to continuing the 30-year tradition of enhancing and improving the quality of life in Sarasota. It’s a social opportunity for residents and visitors to gather and interact, to bring foot traffic to Downtown Sarasota sustaining the economic viability of the entire downtown area, and to provide a venue for other not for profit organizations benefiting Sarasota. The Sarasota Farmer’s Market offers live music & diverse vendors ranging from locally grown fresh produce to holistic products to fresh caught seafood. Home to three spectacular attractions. The Museum of Art features European, American and non-Western art, with masterpieces from the 17th century Baroque period. Cà d’Zan is the Ringlings’ 32 room Venetian-Gothic mansion on Sarasota Bay. The Circus Museum displays memorabilia and artifacts from the eventful history of the Ringling Brothers Circus. Set amidst a tropical paradise, St. Armands is an enchanting circle boasting more than 130 fine shops and gourmet restaurants. Relax in the restaurants, explore the shops – from trinkets to treasures, gourmet snacks to candlelight feasts, you’ll find it all on St. Armands Circle. A spectacular orchid center with tropical display house, garden, ground and boardwalk by the bay. More than 20,000 exotic tropical plants. Explore the wonders of the sea at the 135,000 gallon shark exhibit, touch pools with Rays and sea creatures. See a preserved giant squid and visit with manatees, sea turtles and more. The Sarasota Ballet is the Gulf Coast of Florida’s only professional ballet company. Florida’s largest wildlife rescue and rehabilitation, the sanctuary rescues more than 4,000 birds, mammals and reptiles each year. Visit the sanctuary or explore Sarasota’s natural beauty aboard the 40 foot pontoon Peli Boat. State-of-the-art science and technology museum featuring an array of interactive, hands-on exhibits designed for all ages. Florida’s largest state park. See alligators, some of the 200 species of birds, deer, feral pigs and bobcats. Nature trails, observation decks and airboat tours. See more than 100 classic cars spanning more than 100 years. Featured are extremely rare vintage autos, limited production classics, racy muscle cars and breathtaking exotics. Enjoy the Bradenton area waterways. Rentals available from WaveRunners, jet skis, pontoon and fishing boats and parasailing. A “Natural Environment” attraction with bird and reptile shows daily. Beautiful gardens with cool jungle trails that wind through lush tropical vegetation, thousands of palms, tropical flowers, exotic birds and animal exhibits. Bike and Kayak rentals with free delivery and pickup. Guided Kayak tours for every taste and ability – beginner to advanced. All tours include kayaking equipment, safety gear, lessons and transportation. Boat rentals and sales. Cannon Marina offers the newest and largest fleet of rental boats on Sarasota Bay for fishing, skiing and cruising fun. Tackle and water skis also available for rent. Scuba Diving instruction and equipment rentals. One and two tank charters also available. Across the street from the Wreck of the Regina (aka the Sugar Barge). Please help yourself to the free literature and flyers available in our resort office for additional information about these and many other places of interest in the Sarasota/Bradenton area. Can’t find the dates you’re looking for online? Give us a call at 941-383-3791, we may be able to help! Remember ALL of our units face the Gulf. See you under the Tiki Hut!